The number of air passengers is on the rise. The volume of air cargo is increasing. And security challenges continue to grow. Everyday operations in such a difficult environment require efficient mobile communications. What's more, people work in teams and need to exchange information and data in groups. Are you considering the purchase of a new communication system? As a buyer, you can best ensure your investment if you get five important considerations right. 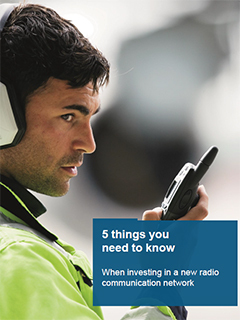 Why choose digital radio communications? Running a major airport requires communications just as a big event does — the Olympic Games, maybe — but every day, day in, day out. Serve your airports' complex radio communication needs with Virtual Private Networks. Your many different airport user groups can each have the experience of using their own private network. Minimize the the costs of your project. The professional mobile radio network at Aéroports de Paris is a successful case of reducing initial and operating costs. Busy airports manage hundreds of flights a day, each requiring dozens of employees to communicate with each other. With a modern radio network, dispatchers can set up temporary talk groups for each flight, remotely over the air. A person serving several flights can follow communications in all her groups by using the priority-scanning feature on her TETRA radio. What's the future of TETRA? After all, broadband technologies such as LTE offer great possibilities. New multimedia-enriched messaging or video transmissions from the field can bring new efficiencies to everyday operations. How to move to broadband? How should an airport move to LTE the professional way? Learn how an airport can adopt the hybrid network model and secure its existing investments in communications. Smartphone users in professional operations? Smartphones and other smart devices are so common today that there have to be ways to include their users also in professional operations. In practice, the Tactilon Agnet smartphone app can enlarge the operational area beyond your airport. This can give you many new opportunities. Tactilon Agnet is fully integrated into the Airbus TETRA system, making the use of existing processes and systems very easy. 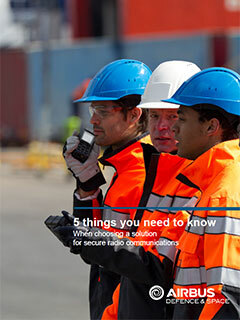 Are you thinking about a new radio communication system? Buying a network is a major decision. As a buyer, you consider five things that can affect your everyday operations. Claricor radio communication system is the smart choice for airport installations. It still packs the punch of a full-sized system. Claricor can be easily expanded as the needs grow. Whatever the job or situation at the airport, there is a radio that is up to the task. When your organization uses both a TETRA radio system and TETRA radios delivered by Airbus, you can benefit from a number of synergies. Tactilon Dabat - Smart. Strong. Secure. Tactilon Dabat is more than a smartphone. Tactilon Dabat is more than a PMR radio. Tactilon Dabat is world’s first - a smartphone and a full TETRA radio in one device. With the help of digital radio communications from Airbus, many airports around the world have improved the efficiency of their operations. Thousands of PMR users at Paris airports share the use of the radio communications system — and its cost. Discover how Aéroports de Paris (ADP) manages the largest air-traffic zone in Europe. Sometimes it’s not important to know the name of the person you’re talking to. Learn how the teams at Düsseldorf airport work — thanks to the dynamic, role oriented communication system set up in their TETRA radios. Digital PMR radios now support the smooth running of Beijing airport, one of the world's busiest airports. Discover why Beijing airport changed from analog to digital and which have been the benefits. Sri Lanka’s Bandaranaike International Airport (BIA) is enjoying improved security and more efficient co-operation between different departments — thanks to its new digital communications system. More than 50 organisations took part in major disaster exercise at Helsinki’s Vantaa airport. Learn how the Finnish public safety network VIRVE can handle it — whether it's exercise or real emergency. Smooth operators - what do the best performing airports have in common?